TDF-USA is a non-partisan and a non-profit group based in USA dedicated for the development of Telangana. We take this opportunity to impress upon you the need and urgency of your action in the form of working toward a separate Telangana State. As you quoted Victor Hugo over a decade ago, “No army can withstand the strength of an idea whose time has come” and the Telangana people’s aspiration is one such. Telangana has been subjected to oppression and neglect for over five hundred fifty years. First five hundred years, Muslim Kings made the decisions for Telangana, and the last 47 years, Andhras are making decisions for Telangana. 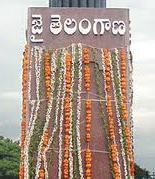 The Telangana people were free for only four years (1952 – 1956) to make their own decisions. Freedom to determine one’s own destiny, as you know is the highest of the rewards for a true democracy. Four and a half decades have passed since the State of Andhra Pradesh was formed. As you are aware, the merger of Telangana with the former Andhra State became possible only because a set of solemn promises were made and constitutional guarantees were given to protect against the possible neglect and exploitation of Telangana. These promises were made not just once, but numerous times and all were broken. Consequently, the exploitation of the region and its people is continued. The people of the region are not only deprived of their legitimate share in the development but are also marginalized in the political process. They have been humiliated on the cultural and linguistic fronts and are virtually reduced to the status of second-class citizens in their own homeland. A prolonged neglect of the region has provided a fertile ground for the emergence and spread of Naxalite violence and also unending farmer suicides. The development scenario of Telangana is very depressing. There is not even a single sector in which this region has not been ignored. We would, however, like to bring to your notice only a few areas to underscore the gravity of the situation. The literacy rate in Telangana is 37% as against 46% in Coastal Andhra, 45% in Rayalaseema and 72% in the Capital City. Enrollment of students at the school level in Telangana is 30% instead of 40%, based on the size of population. Over 75% of the expenditure on government and government-aided colleges is incurred in the other two regions. Out of 21 Universities and University level Institutions funded either by the State or the Central Government, 3 are located in Coastal Andhra, 7 in Rayalaseema, 10 in the Capital city and just one in the entire Telangana region. 69% percent of catchments area of river Krishna and 79% percent of catchments area of river Godavari are in the Telangana, and Telangana region gets less than 15% of the river waters. The Coastal Andhra has usurped 80% of assured waters of Krishna allocated to the State by the Bachawat Tribunal. 90% of surplus waters, yet to be allocated, are reserved for the Rayalaseema, denying the Telangana its rightful share. The Godavari waters have already been harnessed to irrigate more than 12 lakh acres in Coastal Andhra while the corresponding figure for Telangana is 4 lakh acres. The proposed Polavaram Project on Godavari is to serve the Coastal Andhra region is planned to be six times larger than the proposed Ichampalli Project to serve the backward Telangana region. The net area under tank irrigation in the Telangana region had declined by 76% between 1956 and 1998. The Telangana farmers mostly depend on well irrigation. The farmers of Coastal Andhra get cheap canal water subsidized by the State, while the Telangana farmers are forced to pay higher electric pump bills. The net cultivated area in the Telangana region has decreased by 22% during the period 1956 and 1998, while it has increased by 4.25% in Coastal Andhra region. 40% of the cultivated area in the State is in the Telangana region, and the institutional credit available to the Telangana farmers is far less. They get 18%, 23% and 28% of the total credit provided by the District Cooperative Central Banks (short-term), the A.P. Cooperative Central Bank (long-term) and the Scheduled Commercial Banks. Inadequate Institutional credit is forcing the Telangana farmers to fall into the debt trap laid by the private moneylenders, leading to an unprecedented number of suicides during the last five years. No major industry worth its name has been setup in any of the districts of the Telangana region as compared to the establishment of several industries in Visakapatnam, Vijayawada, Kakinada, Nellore, Tirupati, and Cuddapah. Quite a few major industries established in the Telangana region during the rule of Nizams are being closed one after the other by the successive governments. Important among the closed industries are Azamjahi Mills (Warangal), Sir Silk Factory (Sirpur), Antargaon Spinning Mills (Adilabad), DBR Mills, and Allwyn Factory. Further the famous Nizam Sugar Factory (Nizamabad) is on the verge of closure. There are about 15 lakh jobs in the government and government-funded offices and establishments. Based on the size of population, 40% of these jobs, i.e. 6 lakhs, should have been filled in by the Telangana job seekers. But the total number of jobs now occupied by them is less than 2 lakhs. The State Government issued orders as back as in the year 1984 to remove all the non-locals appointed and to appoint only Telangana locals against the vacancies created. Besides not implementing these orders, further recruitment of non-locals in the Telangana region is going on. The contribution of Telangana region to the State’s Exchequer has all along been around 43%. But the expenditure incurred on the development of this region has never been more than 25%. The lower per capita income of the Telangana region enabled the State Government to get higher allocation of funds from the successive Finance Commissions. But the benefit of such higher allocation of funds never materialized for the Telangana region. More than 80% of loans taken from the World Bank and other International and National agencies are being spent for the development of Coastal Andhra and Rayalaseema. But the burden of repayment of these loans and interest on them is being borne by the people of Telangana to the extent of 40 to 43%. A cumulative effect of these and similar factors, over the years, has been the diversion of thousands of crores of rupees meant for the development of Telangana region, for the development of other regions. The situation in other sectors is equally, if not more, alarming. The Drinking water is a major issue for the Telangana region. The people mostly depend on bore-wells for their drinking water and are inflicted with fluorosis. The fluorides in the drinking water cause permanent disfigurement, brain damage and there is no cure for it. Telangana is rich with resources. Telangana people are asking: Use Telangana resources for the development of Telangana region for the betterment of Telangana people. We hope that the national government under your stewardship is aware of these facts. Formation of Telangana State is as explained earlier is the aspiration of the natives. That aside, the principles governing smaller states to bring government closer to people would build up the economy and empower people in the process. Telangana people opposed the formation of Andhra Pradesh state in 1956, they overwhelmingly voted for a separate Telangana state in 1969. In 2004 elections, the people of Andhra Pradesh accepted the concept of two states, voted overwhelmingly for TRS-Congress alliance, and rejected the TDP appeal for united Andhra Pradesh. TDF-USA congratulates you for taking the step toward initiating a dialogue through President’s address to the Parliament and further clarifying it in your first Press conference the future Telangana state. Telangana people have committed to achieve their statehood through non-violence. The conditions are ripe and there is consensus on ground with out any unnecessary hate or dislike toward each other. The time for Telangana has come and please understands that TDF-USA will continue to work towards the betterment of the region.